Living in a big city can be fun. But almost everything in a big city tends to be more expensive, from meals out to groceries to morning coffee. And housing is often the most expensive part of living in a city. 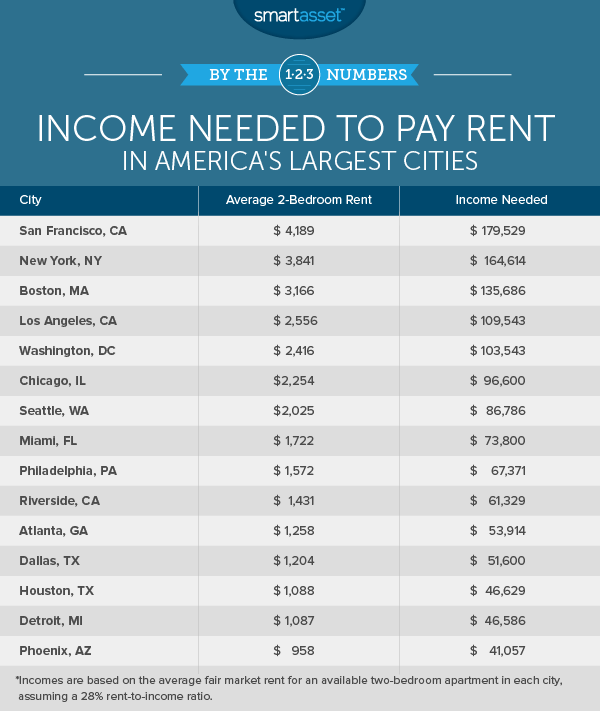 Below we look at data on rents in 15 major U.S. cities and estimate how much you would need to earn in order to afford a two-bedroom apartment. Thinking about switching from renting to buying? Check out our rent vs. buy calculator. In order to determine how much income you need to earn to pay rent, SmartAsset analyzed average rent data and compared it to the Department of Housing and Urban Development’s affordability threshold. To see where we got our data and how we put it together, read our our data and methodology section below. Costly California – According to our data, there are 15 cities in the U.S. where you need to earn at least $100,000 in order to comfortably afford the average two-bedroom apartment. Ten of these cities are in California, with the Bay Area leading the way. 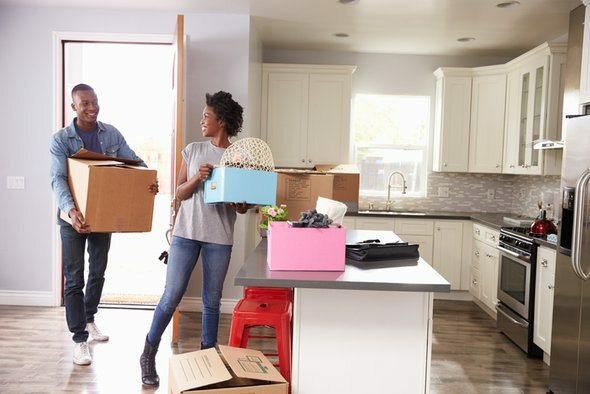 Affordable Midwest – In some cities, especially in the Midwest, you don’t need to make a ton to live alone in a spacious abode. In Toledo, Ohio, for example, we found that in order to afford the average two-bedroom dwelling you need to earn just under $29,000 per year. This may be within reach for many residents as Census Bureau data shows the median individual in Toledo is slightly below $22,000. 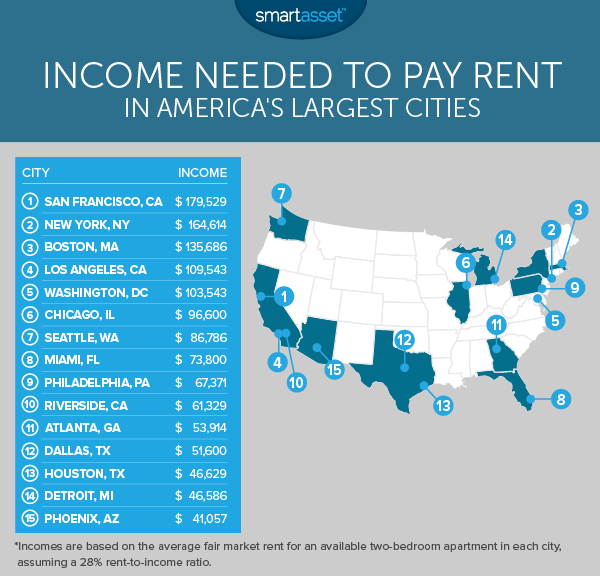 This is SmartAsset’s third annual study on the income needed to pay rent. Read the 2016 version here. San Franciscans are familiar with paying high rents. According to our data, in order to comfortably afford rent on the average two-bedroom apartment in San Francisco you need to earn $179,529. That’s $15,000 more than the income you’d need in New York City. Only 31% of SF households make more than $150,000 per year. If you’re thinking about moving somewhere as pricey as San Francisco, you might benefit from getting financial planning help from a financial advisor. Renting in the Big Apple is expensive. Our data shows that monthly rent for the average two-bedroom apartment costs $3,841. In order to make sure you are putting only 28% of your income toward that apartment, you will need to bring home $164,614 annually. Of course, rent is not the only thing that’s expensive in New York, so saving as much as you can on housing is important. To comfortably afford the rent on the average two-bedroom apartment in New York’s Northeast rival Boston, you will need to have a spare $3,166 per month. But you can’t spend all your money on rent, so in order to pay for that apartment and live comfortably, you’ll need to earn around $11,307.14 per month, or $135,686 per year. Angelenos looking to afford a two-bedroom apartment will also need to earn in the six figures. According to our calculations, they need to earn around $109,543 per year to pay for the average two-bedroom apartment in L.A. without being housing cost-burdened. Washington, D.C. is the last big city on our list where you’ll need to earn at least $100,000 to rent a couple of rooms. If you enjoy living near the capital but $103,000 is too rich for your blood, consider looking to rent in Alexandria. Rent for the average two-bedroom there is $1,788 per month, meaning you will need to earn around $76,000 to comfortably afford it. Rents in the Windy City could blow you away. To comfortably pay for the average two-bedroom apartment in Chicago, you will need to earn at least $96,600 per year. If you can’t afford that or don’t have buddies in the local area to split it with, consider moving out to Naperville. To afford the rent on the average two-bedroom apartment in the suburb of Chicago, you will only need to earn $63,857. If you’re thinking about moving to Seattle, you’re not the only one. From 2000 to 2015 Seattle’s population grew by 100,000. All this growth may have created a competitive rental market. In order to comfortably afford a two-bedroom apartment in the Emerald City, our data suggests you’ll need to earn at least $86,786 per year. But once you live in Seattle, or anywhere in Washington state, you’ll get a bit of a break on your taxes, as Washington does not have any income tax. Our tour of the rental housing market goes from rainy Seattle to sunny Miami. Residents here can get their hands on the average two-bedroom apartment while earning $73,800. This makes Miami the most expensive city to rent in Florida. If you like the Miami vibe but not the Miami rent prices, you could consider getting a roommate. If not, Hialeah, Florida could be a good option. We estimate you would need to earn around $13,000 less to live in a two-bedroom in Hialeah than you would in Miami. Philadelphia is known for a being a relatively affordable big city. For example, if the average Philadelphia resident wanted to save for a down payment on the average home it would only take them 3.8 years of saving. That compares very favorably to other cities like New York or Los Angeles, where saving up for a down payment on the average home would take over nine years. Our data suggests that if you want to comfortably afford the average two-bedroom apartment in the City of Brotherly Love, you’d need to bring home $67,371 per year. At an estimated annual income of $61,329, Riverside is one of the more affordable options for renting in California. You would need to earn $40,000 less to rent the average two-bedroom here than you would in Los Angeles, which is a mere 50 miles to the west. Rent is very reasonable in Atlanta. A two-bedroom apartment will only set you back just over $1,200 a month on average. In order to comfortable afford that, we suggest an annual income of around $54,000 per year. Atlanta is also a rare case where living in the city may be cheaper than living in the suburbs. To comfortable afford the average two-bedroom apartment in Sandy Springs, a suburb city just north of Atlanta, you would need to earn $54,857 per year. That’s roughly $1,000 more than you would need to earn in Atlanta. Rent is generally affordable in Texas and Dallas is no exception. According to our data, a person earning $51,600 per year may be able to comfortably afford the average two-bedroom apartment. So if you’re earning more than that in Dallas, maybe you can squirrel away some additional funds into your 401k or IRA. Housing in Houston is slightly less expensive than it is in Dallas. In order to comfortably afford the average two-bedroom apartment in the Magnolia City, we recommend earning about $47,000 per year. However the average two-bedroom apartment may be unaffordable for the typical Houston earner. U.S. Census Bureau shows that the average Houston resident earns just under $26,000 per year. Detroit has some of the lowest rent prices among the nation’s largest cities. The average two-bedroom apartment in Motor City will only set you back $1,087 per month. In order to afford that and not be housing cost-burdened, you will need to earn just over $46,000. Phoenix rounds out our list. Real estate in the Phoenix area is quite affordable, at least compared to some other big cities. In a past study we found that Phoenix had one of the lowest incomes needed to afford mortgage payments. In terms of rent, we see that once again Phoenix is one of the more affordable big cities in the country. To afford the average two-bedroom apartment in the Valley of the Sun, you need to earn just over $41,000. To find the income needed to afford rent in the largest U.S. cities, SmartAsset began with the Department of Housing and Urban Development’s guideline that those who pay more than 30% of their income on rent are housing cost-burdened. We decided that in order to comfortably afford rent, residents should spend no more than 28% of their income on housing. We then gathered data on average rent prices for a two-bedroom apartment in 242 cities across the country. To come up with our final income number we calculated how much someone would need to earn in each city in order to pay only 28% of their income on rent for the average two-bedroom apartment. For the purposes of this article we focused on 15 of the largest cities in the country. Data on two-bedroom rents comes from Rentcafe.com and is from January 2017.